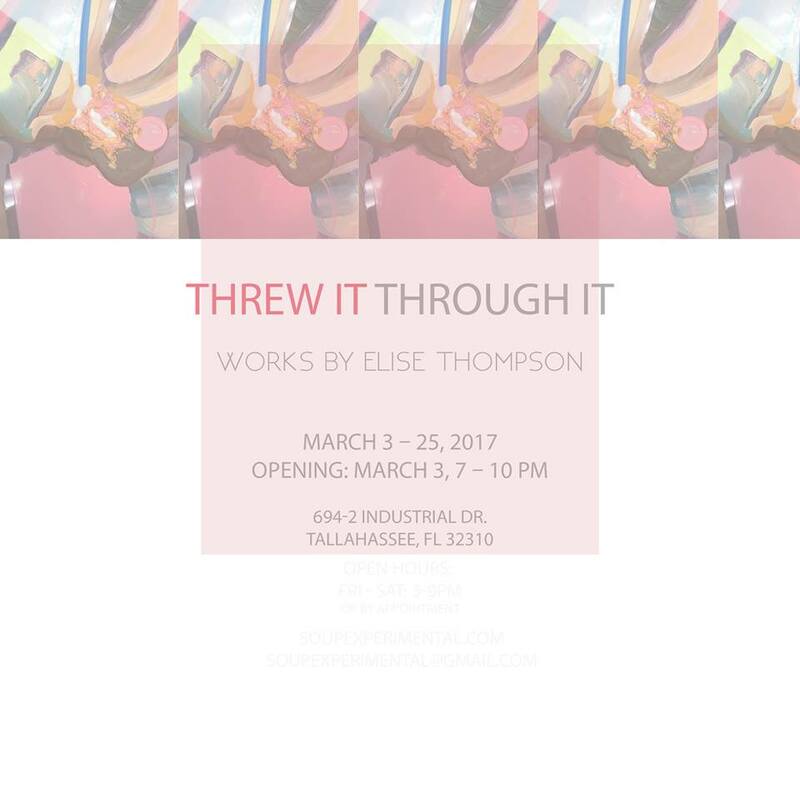 Please join us at Soup Experimental on March 3 for the opening reception of Threw It Through It, a solo exhibition featuring various artworks constructed by FSU Art MFA ’16 Elise Thompson. The exhibition will remain on view until the 25th of March, and the opening is on First Friday from 7-10pm. Elise Thompson was born in Cincinnati, OH, and received her MFA in Studio Art at Florida State University in 2016. She was awarded the Brian Andrew McLaughlin Award in 2014 and 2015, and the Mary Ola Reynolds Miller Endowed Graduate Scholarship in Visual Arts in 2016. She, with peers and faculty, participated with the Cátedra Arte y Enfermedades in an international project titled “Perspectives: Art, Liver Disease, and Me” with an exhibition in Valencia to bring awareness about patients who suffer from hepatitis C. Elise was represented by Working Method Contemporary at Aqua Art Fair in 2015 and was invited to show in an exhibition curated in St. Petersburg, Russia featuring American art at ArtMe Today in 2016. She attended the Boom Gallery Summer Fellowship and Residency in Cincinnati in June 2015 via an Exceptional Opportunities award from FSU and a residency at the Vermont Studio Center in July 2016. Elise was published in New American Paintings #124 South this past June. She recently concluded her tenure as co-director at 621 Gallery in Tallahassee, FL and continues to teach in the Art Department at Florida State University.